Adoni Municipal Corporation, Bhimavaram Municipal Corporation, Bobbili Municipal Corporation and Salur Municipal Corporation. Candidates who are qualified Civil Engineering Degree they are eligible for applying this GEA posts. Application form is available for download at www.cdma.ap.gov.in. Last date to submission of application form through email is 30-11-2018 at 05:00 PM. 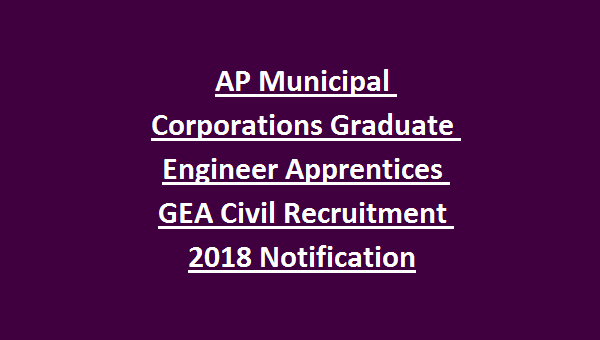 Detailed information about this AP Municipal Corporations Graduate Engineer Apprentices Posts is given below. Last date to submission of application is 30-11-2018. Based on merit in Engineering Subjects candidates are called for interview or documents verification. This Graduate Engineer Apprenticeship Period is 9-12 months. 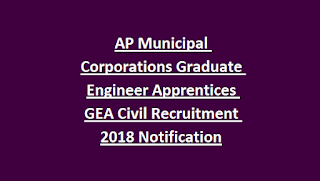 Candidates who are interested in this Graduate Engineer Apprentice vacancies they can send their application through Email to their respective Municipal Corporations. Application form is available for download at www.cdma.ap.gov.in. Municipality Wise Mail Ids are given below to submit application form:. when will vijayawada GEA 2018 results released??? ?